Each thread of STL1212 DRM computer installed at Compositor Software physical server holds up to 24 real-time, 24 signal-rate and 24 transmission-rate processes. STL1212 allows running up to 8 Compositor v6 systems at once, which results in a stock growth for Compositor v6 and forthcoming Compositor v7 systems. Use the above table to review how many STL1212 DRM resources your current system consumes. STL1212 consists of 8 threads, totaling 24 cores. One STL1212 per hard drive allowed on a stationary machine. As you see, 8 real-time Compositor Max for Live users allowed simultaneously for one STL1212 DRM virtual server. 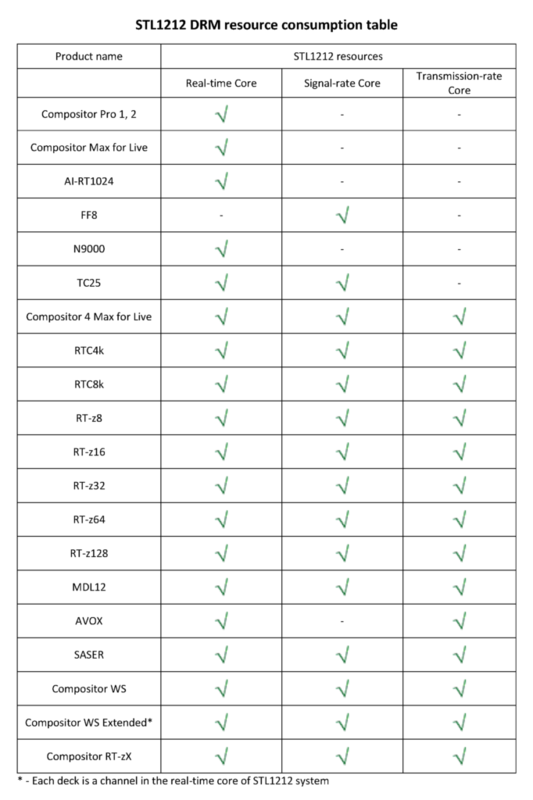 If one user runs two Compositor Max for Live modules simultaneously, which is not allowed due to the license limitations, the quantity of free STL1212 DRM slots decreases. For example, Compositor v3 Hypervisor employs several cores simultaneously, when all modules engaged. Let me count how many cores Compositor v3 Hypervisor user will consume when feeding SASER with AI-RT1024 and FF8 feeders. RTC8k arranger must be enabled for Link mode to be active and this process consumes 3 cores at once (one real-time, one signal-rate and one transmission-rate core). SASER itself consumes as many cores as RTC8k and equals to 3 cores also. It is already 6 cores and STL1212 could host 6 more threads, totaling 18 cores. Next, let’s count AI-RT1024 and FF8. They are consuming one real-time and one signal-rate core when work simultaneously. Summing with previous results, it is 8 cores for one Compositor v3 Hypervisor user. It leaves headroom for using other instruments on one DRM virtual server, because 3 real-time, 3 signal-rate and 2 transmission-rate cores are used. STL1212 DRM computer allows running two v3 or v5 Hypervisors together. The thing is more difficult with v7 Hypervisor: it consists of only one-threaded modules and it is allowed to run two v7 Hypervisors together on one DRM machine only if current user employs Compositor WS Extended, and not more than three feeders. Each deck of Compositor WS Extended consumes only one channel of 24-channel Compositor core. Take this in account when using deck players alongside the feeders.